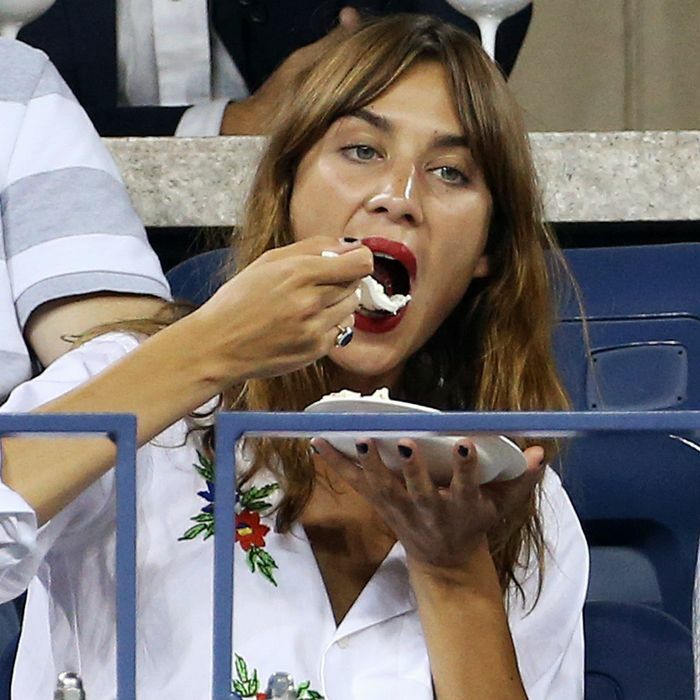 Alexa Chung knows good tennis eats. What with Maria Sharapova’s last-minute withdrawal and Serena’s historic march toward the record books, you’d be forgiven for missing some of the major food news that’s also coming out of this year’s U.S. Open, which starts today. Luckily, Grub Street’s got you covered: At a recent preview tasting held at Aces in Arthur Ashe Stadium, we got the scoop on some of the most interesting new things to eat, so you’ll know what’s worth the inevitable, hefty markup. Many of the regular players from last year are back in good form, like Tony Mantuano of Chicago’s Spiaggia, whose new avocado toast with pickled peppers ($10) at the Wine Bar could be the most Instagrammed snack of the tournament. Chef Michael White is a newcomer to the fray this year, bringing a few big-ticket menu items from Costata and Marea to Champions, like a 40-ounce rib eye ($125) and his famous lobster with burrata with pickled eggplant ($25). It’s also the second year for food trucks next to Court 17. Joining veteran Morris Grilled Cheese — get the gouda-and-bacon sandwich ($13) — is Thai/Vietnamese truck Sweet Chili, which will be peddling a tangy honey chili pork and rice plate ($14) and crisp bean sprout salad ($14). And, as always, you’ll find the regular stadium standbys — ice cream, lots of beer — and you can head to the official site for this year’s full dining rundown.